What is the difference between business intelligence (BI) and big data? Is big data just a more modern version of BI, or are there significant differences? If they are different, what are the typical use cases for each? If they are the same, where do they intersect and overlap? 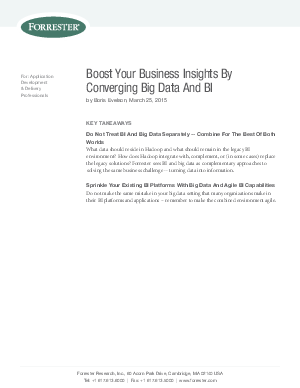 Should organizations manage BI and big data platforms and applications together or separately? In this report, Forrester Research recommends that application development and delivery (AD&D) professionals working on BI and big data initiatives get the best out of both by designing and integrating them in a flexible data platform. This report proposes such a flexible platform, describes components and use cases, and provides recommendations on how to get started and pitfalls to avoid.